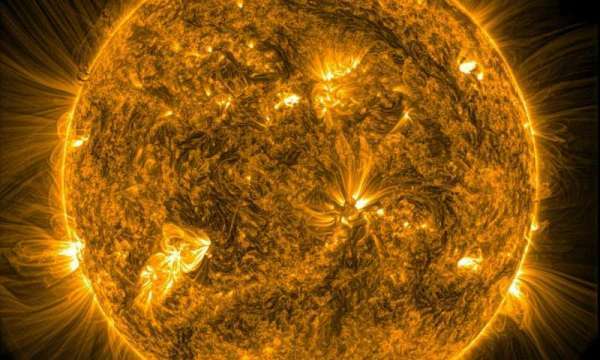 New research undertaken at Northumbria University, Newcastle shows that the Sun’s magnetic waves behave differently than currently believed. Their findings have been reported in Nature Astronomy. After examining data gathered over a 10-year period, the team from Northumbria’s Department of Mathematics, Physics and Electrical Engineering found that magnetic waves in the Sun’s corona – its outermost layer of atmosphere – react to sound waves escaping from the inside of the Sun. The team discovered that the sound waves leave a distinctive marker on the magnetic waves. The presence of this marker means that the Sun’s entire corona is shaking in a collective manner in response to the sound waves. This is causing it to vibrate over a very clear range of frequencies. This newly-discovered marker is found throughout the corona and was consistently present over the 10-year time-span examined. This suggests that it is a fundamental constant of the Sun – and could potentially be a fundamental constant of other stars. Dr. Richard Morton, the lead author of the report and a senior lecturer at Northumbria University, said: “The discovery of such a distinctive marker – potentially a new constant of the Sun – is very exciting. We have previously always thought that the magnetic waves were excited by the hydrogen at the surface, but now we have shown that they are excited by these sound waves. This could lead to a new way to examine and classify the behavior of all stars under this unique signature. Now we know the signature is there, we can go looking for it on other stars.